My week in pictures is back, if your a long time reader then 1. your awesome and 2. you may remember i used to do these. I stopped for some unknown reason, but now behold they are back. This is actually my week in pictures i know rebel, but i could cut half of it off after the butterfly. That would have looked a bit odd. So starting from the bottom now we here lets get on it. 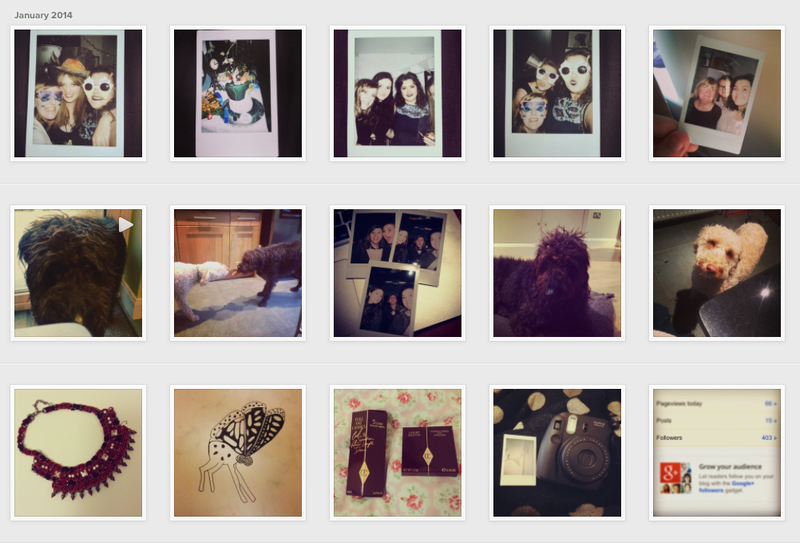 Bottom row (left to right) : My new zara necklace beaut, butterfly deer hybrid drawing thing, ohhh charlotte tilbury makeup, polariod camera, hitting 400 followers on here you guys da bestest. Top row (left to right) : Friends 21st mad hatter themed birthday party johnny deeps hat from alice in wonderland is on her head, caaakkkkeeeeee, friends ohh i actually have some, again more friends, finally my madre and schwester. So yeahhh, there you go, i apologise now in advance, way in advance, for the lack of videos and posts that will be not coming up in the next 3 months. I am so tied down with my dissertation and uni work, you literally have no idea, how little time we have. I will try and get some in, but it may just be blogposts for now, as they are a lot easier to do, plus you don't have to look somewhat decent for writing them she says in a very muddy paw print white jumper. I was meant to film a bunch this weekend whilst at home, but I'm not gonna lie, friday i was lazy and couldn't be bothered, saturday i was recovering from a night out and well i looked like sh*t so that wasn't happening and today, i also am still recovering. this is why i don't drink, it takes me about 6 years to actually recover. damn you mojitios. why you so nice and stupidly expensive. Anyway, there is my awful excuse and i will write some more non hungover tired not feeling sick posts soon.